so, i should start off today by saying that i have been leery of posting progress shots because i don't necessarily want pictures of my house all over the interwebs, especially when i'm not done (which, really, are we ever done?). plus, it's going to be a very slooooooow process, and that could get old. but i also know that if i'm going to do an unprecedented amount of house decorating discussion here, it would be crazy not to show you bits along the way. so. against my initial judgement, let's talk about one of the first things i've actually committed to (yay commitment!) . . . the family room rug. exciting? maybe only to me. feel free to humor me here. as of now, my vision for this room involves basically different everything furniture-wise (except the armoire and maaaaybe the parsons chairs) and i seriously heart the idea of grasscloth walls (leaning towards yellow hues), but a similar arrangement. 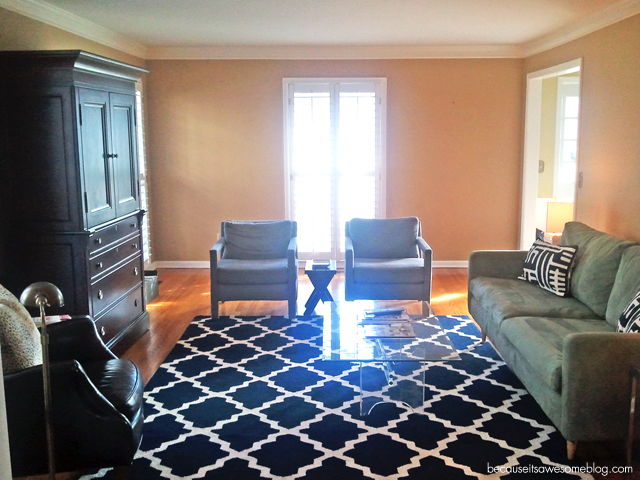 i imagine an upholstered ottoman eventually, which will break up the pattern a little, but i'm otherwise really loving the visual impact of our new trellis rug! i considered something "safer" like charcoal (which is quite lovely, if you ask me), but was compelled to go with more color. mostly because i haven't committed to a sofa and, subsequently, a sofa fabric/color. gray on gray isn't my goal for this room. although, i'm not against it in theory. other commitments include a beautiful new upholstered bed for the master, but we are lacking appropriate bedding, so you'll have to wait to see that. i'll elaborate on my vision for this room in an upcoming post. Such a gorgeous space Tobe! I love it! It's great to start with a bold focal point and go from there. I'm looking forward to see what comes next! Gorgeous rug!! And I love those pale blue chairs as well- can't wait to see your vision come to life! Tobe, it's really looking great! LOVE the rug - it's just perfect!! i love to see inside homes whether finished or not..so keep it coming. and i agree about the ottoman. Gorgeous rug !!! Loving your ideas..cant wait to see more ! oh! Couldn't agree more, LOVE the impact of the rug, such a beautiful statement, love it! Lookin gooooood. The rug is fantabulous. OMG the rug makes me die. It's gorg. I love your chairs and that fab coffee table too! I think your judgement to show us was good, it's always fun to feel like we are part of the process!! Thank you for your visits lately, I so appreciate it!! 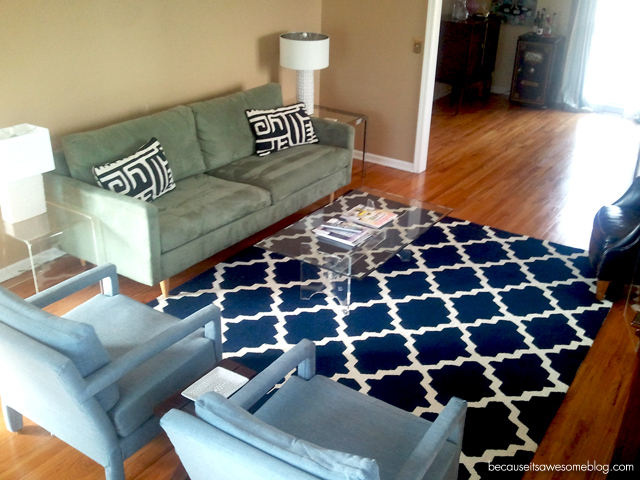 love the rug and those end tables, yes! I can't wait to see more! Your accent chairs are to die for. hooray for commitment! That such a great pattern to work around. Easy to layer other colors and patterns on if you so desire. I approve. If you don't want to buy a new sofa, have a slipcover made! I'm kinda addicted. And yes to an ottoman. Oh LOVE! I can't wait to see how it evolves. Oh and for the record I say YES to grasscloth and YES to the parsons chairs! Love the pattern for a big statement! At first I though your walls were a salmony peach which would look amazing with your navy rug and blue chairs!